Unseen Forces limited edition “gore splattered” 140 gram double-vinyl release of the original score to Fede Alvarez’s 2013 horror film Evil Dead by composer Roque Baños. Release date: October 31, 2013. 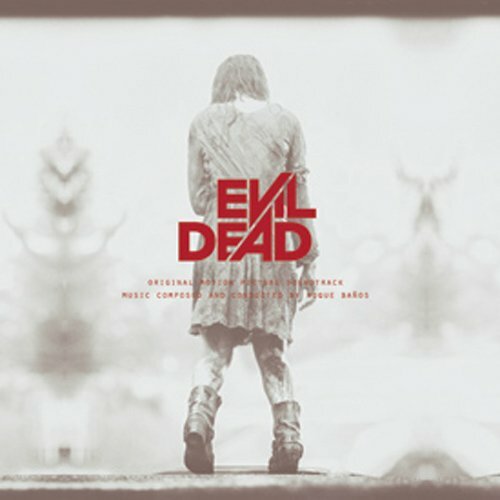 Note: A further 2000 copies of the Evil Dead score are being released on vinyl by different distributors with different configurations in NA and UK/EU. But only this limited release of 500 copies contains the gore splattered vinyl configuration. Spanish composer Roque Baños bring a beautiful and also eerie, crisp modern score to Alvarez’s horror remake. Baños studied music at the Upper Music Conservatory of Murcia and Madrid’s Real Conservatorio Superior before graduating from Boston’s prestigious Berklee College of Music, but this score bears no resemblance to his previous jazz influenced scores. Here the maestro eloquently assumes the role of firestarter, conducting like a pyromaniac invoking the destructive majesty of flame – both demonic and cleansing – with smoldering strings and brass building toward total aural incineration. To that end, he cleverly employs a prominent siren motif that at turns suggests a dreadful fire alarm in slow motion, the nostalgia of an amusement park haunted house attraction and a prodigious yawning door somewhere in the deepest chasm of hell. It’s also one of the more eerie aspects of the score that works as perfect out of the film as it does in. A thoroughly cinematic experience suffused with sweeping overtures and jarring choral crescendos, Baños has created a dark and vital epic for the ages.